1. A reversible duvet set with a classic chevron side that perfectly complements the modern floral pattern opposite it, for anyone who loves flowers as much as they love a good grayscale. Get it from Amazon for $48.99+ (available in eight colors and three sizes). 2. A pineapple duvet set so you can ~tropic~ like it's hot every time you jump into bed. Includes a duvet cover and two pillow cases. Get them from Amazon for $48.99+ (available in 10 colors and three sizes). 3. A brushed microfiber sheet set with stitched piping and a sinfully soft finish, for anyone who wouldn't mind sleeping in the literal lap of luxury. These sheets have over 42,000 five-star reviews! Get it from Amazon for $27+ (available in 39 colors and seven sizes). 4. A bed in a bag featuring a floral pattern so bright and bold all your ~buds~ will be jealous of your bedding. This includes a comforter, sham, fitted sheet, flat sheet, pillowcase, and decorative pillow (two shams available in the larger sizes). Get it from Walmart for $44.82+ (available in four sizes). 5. 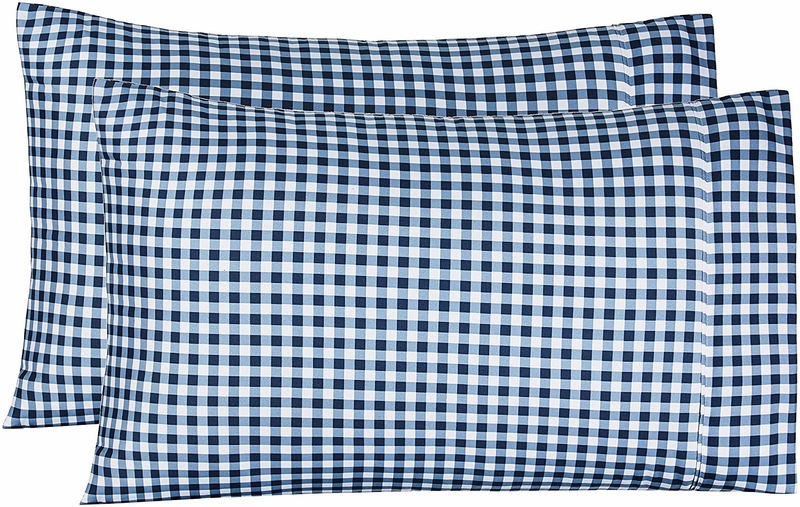 A satiny pillowcase that'll keep you cool at night and keep your hair frizz-free each morning. Promising review: "The satin is heavenly soft. You can really feel the difference against your skin and hair (this was a replacement on another brand —what a difference in quality!). It is zippered, so no worries about your pillow sliding out of the case. It is absolutely beautiful and heavy duty feeling. I will be able to use this case for years, I have no doubt. I feel like it is one of the best buys I've made in quite some time. It washes well and never wrinkles — just delightful!" —Debi S.
Get it from Amazon for $6.99 (available in 24 colors). 6. An *eight-piece* comforter set to throw minimalism out the window and enjoy some overzealously pleated perfection. This set includes a hypoallergenic-fill comforter, two shams, two pillowcases, a bedskirt, and two decorative pillows. Get it from Amazon for $65.99+ (available in two colors and three sizes). 7. A Pioneer Woman comforter so you can dream of the prairie while living in a fifth-floor walk up. Get it from Walmart for $50.20+ (available in two sizes). 8. A not-too-heavy down alternative comforter to use inside your favorite duvet cover or as a stand-alone quilt, adding a piece of plush perfection to your good night's sleep. Get it from Amazon for $29.99+ (available in six colors and eight sizes). 9. A customizable boho bedding set that's truly gonna be to tie-dye for. Get it from The Home Depot for $17.99+ (available in three pillow sizes and four comforter sizes). 10. A wet head pillowcase — one side is soft cotton and the other is an absorbent microfiber towel, so you can flip to that whenever you go to bed with wet hair to absorb water without ruining the pillow underneath. This works for sweat, drool, and wet or conditioned hair. 11. A flannel duvet set with a soft, pill-resistant fabric for anyone who knows a blocked dryer is a tough ~pill~ to swallow on laundry day. You can also get a matching set of sheets here. Get them from Amazon for $65.40+ (available in five colors and two sizes). 12. A pleat comforter set so you can sleep on a bed as white and fluffy as the sheep you're counting at bedtime. Reviewers recommend ordering a size larger than your bed. Get it from Amazon for $42.99 (available in five colors and three sizes). 13. A plush throw blanket — a black and white statement piece sure to make you say "Pan-duh, I need this immediately." Get it from Amazon for $19.66 (available in two sizes). 14. Or some more black and white bedding so pet parents can show off how Sparky's sleep training is going, in style. Get it from Amazon for $45.99+ (available in two styles and four sizes). 15. A yarn-dyed flannel duvet set with a double napped finish that's gonna properly support your decision to have twice as many naps. Includes a duvet cover and up to two shams. Get it from Amazon for $34.48+ (available in five colors and three sizes). 16. A pair of ruffled pillowcases that'll make your bed look chic even when it's only *mostly* made. Get them from Urban Outfitters for $24.99 (available in three colors). 17. A throw blanket, because it can be a real ~tassel~ finding a throw that works with every type of bedding, but that's what makes this the best. Get it from Forever 21 for $33.99. 18. A reasonably priced weighted blanket — nothing'll take the weight off your shoulders like the relaxing weight of this blessed blanket. Get it from Amazon for $27.99+ (available in six colors and five sizes). 19. A three-piece embossed sheet set for anyone who wants to feel like a boss, despite still sleeping on a twin bed. Get it from The Home Depot for $11.98 (available in nine colors). 20. A trellis-print comforter stuffed full of goose down alternative that's gonna feel like curling up into a cloud... we're not kidding. Get it from Amazon for $26.99+ (available in two colors and three sizes). 21. A gorgeous faux fur blanket made out of microfiber for an incredibly cute (and cruelty free!) look. Promising review: "I started off calling this the Jon Snow blanket because it reminded me of the fluffy cape he wears, but now my family and I refer to this amazing blanket simply as Jon Snow. My house knows no blanket except for the king of the blankets named Stark. Also be forewarned, if you have any direwolves they will immediately take over Jon Snow and he will no longer belong to you. I'm considering ordering a second one just for myself now. Jon Snow is beautiful and soft on both sides and great to cuddle with. He is also machine washable and dryable and comes out looking just like new so long as you wash him in cold water and tumble dry him on low heat. He is from the North after all." —Samantha A. Get it from Amazon for $29.98+ (available in 18 colors and three sizes). 22. A lightweight, silky duvet cover set to make your bed look like it belongs in Versailles. Includes a duvet cover and two pillow shams. Get it from Amazon for $25.95+ (available in two sizes). 23. A set of hotel-quality sheets so you can take a vacation from your problems every time you pull the covers up. 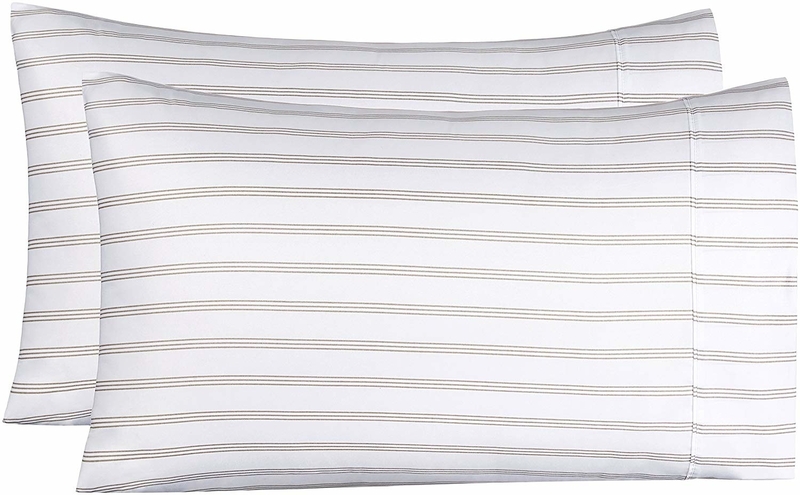 This four-piece set has a flat sheet, fitted sheet, and two pillow cases. Get it from Amazon for $16.99+ (available in 13 colors and five sizes). 24. An elegant black and white duvet set that's also wrinkle resistant, for anyone who can't stand the thought of anything but perfectly pressed bedding. 25. A pair of microfiber pillowcases available in multiple menswear patterns, so you can sport your fashionable finance guy vibes even when you sleep. Get them from Amazon for $9.99+ (available in 21 colors and two sizes). 26. A desert bedding set, because falling asleep without your favorite plants around you would really ~succ~. Each set includes one comforter and two pillow cases. Get it from Amazon for $44.09+ (available in four colors and three sizes). 27. A set of durable microfiber sheets in a posh paisley print for anyone who knows it's what's inside that counts. Get them from Amazon for $16.99+ (available in 24 colors and four sizes). 28. A quilted duvet with a lightweight moisture-wicking fabric (that's also hypoallergenic!) to solve basically any complaint you could ever have about bedding. Get it from Amazon for $24.99+ (available in two colors and sizes three sizes). 29. And finally, a stunning micromink comforter that'll make your bedroom look so fantastic you'll forget the rest of your home even exists. Get it from Amazon for $37.58+ (available in nine colors and three sizes). When your pillow reminds you that you deserve to hit snooze... again.